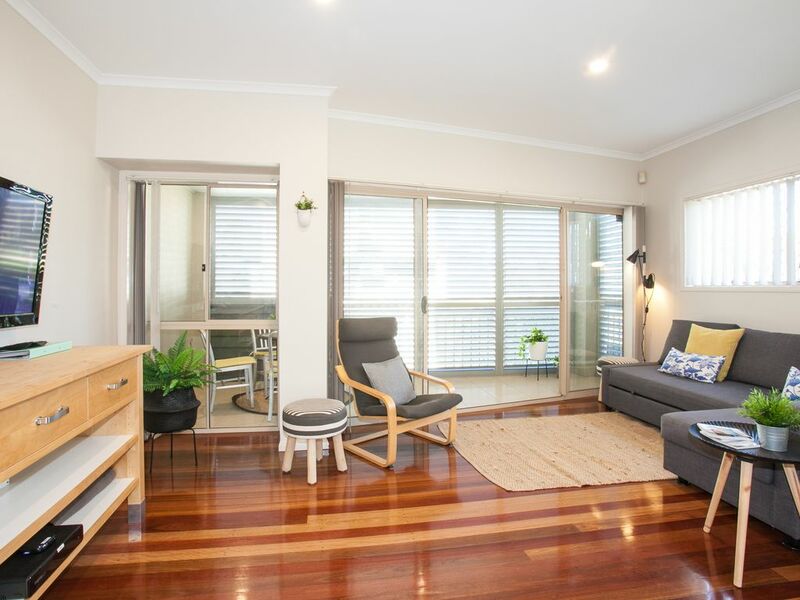 Welcome to our three-bedroom townhouse in St Lucia, just seven kilometres from Brisbane’s city centre. Accommodating up to eight people, guests can happily sleep in one of the three-bedrooms or in the sofa bed in the living room. All your travelling needs will be met with thanks to the kitchen, dining area, outdoor balcony, as well as secure parking. For the ultimate experience, make sure you see the Brisbane River, watch a rugby match at Suncorp Stadium, or check out the Gallery of Modern Art. This townhouse will have you positioned in an awesome area, only 15 minutes away from the city. Only 700m from my home is the Guyatt Park Citycat Terminal, and offers free car parking for all city-cat users as well as a convenient bike rack – and you’ll find yourself in the CBD in minutes.. Regular bus services on Sir Fred Schonnell Dr and Coldridge St will also be of great convenience to you. As soon as you arrive, you will probably want to stock up on all your grocery needs. Luckily, you’re a 10 minute walk to St Lucia Supermarket, a small convenience store nearby. There’s also an IGA supermarket, which is a 4 minute drive away. Step into my home, and be welcomed by fresh interiors and varnished wooden floorboards. The open setting layout will be perfect for all guests, ensuring that you have your own space and can do as you please. Walk on in and you’ll find the living room, with a couch and a large LCD TV. This is the perfect space for you to have a snooze, or watch some of your favourite television shows. There’s also an armchair with a foot rest. Kick back, relax and have some down-time in this comfortable space. The sliding doors to your right, will take you to the outdoor balcony, which has a table that seats four. There are also outdoor shutter blinds out here should you wish to block out some of the Brisbane sun. Guests have access to the entire home – you are booking the ‘entire place’ which means you can make yourself at home throughout. A set of keys will be provided to the doors, allowing you to come and go as you please throughout your stay, 24 hours a day. High quality shopping is just a moment away, with the Toowong and Indooroopilly Shopping Centres offering a range of boutique and brand-name shopping destinations within close proximity. Get a train to Central Station where you can explore Brisbane’s City. Go shopping around Queen Street Mall, which includes numerous malls and street frontage. Shopping centres that I recommend you head to include Wintergarden, Broadway on the Mall, The Myer Centre and MacArthur Central. This area will find you in close proximity to restaurants and bars in surrounding streets, parklands, museums, galleries, the casino and a cinema. If you’re a sporting fanatic, head to Suncorp Stadium to catch a game of rugby! First and foremostly, for those who are driving or renting a car, there is car parking available in an onsite car park. Driving to Brisbane City will take approximately 14 minutes from mine. Public transport is highly accessible from my home. The City Cat Guyatt Park Terminal is only 700m away – this is best public transport to the city and Southbank, and has facilities for free parking for citycat users, and a bike rack for locking bikes. The ride along the Brisbane River is gorgeous and is not to be missed when visiting Brisbane. If you’re looking to catch the bus, there are regular services that run on Sir Fred Schonnell Dr and Coldridge St. Explore St Lucia by foot, where you can find many parks, nearby shops and restaurants. You’re a 10 minute walk to St Lucia Supermarket, where you can purchase your bread and milk, and all your grocery needs. There’s also an IGA, which is a 4 minute drive away, if you wish to stock up on more of a range of groceries. You’re a 10 minute walk to the University of Queensland, where you can explore the campus grounds. One of my favourite places to get in touch with nature is Tarcoola Track, which will have you seeing beautiful bushland, wonderful river views, and some relaxing spots to sit and rest. Entry to the track is directly opposite 157 The Esplanade, a 6 minute drive. For golf lovers, you can enjoy the nearby St Lucia Golf Links.